On Thursday, 18 January 2018, the REEEP and SANEDI Teams hosted a Close Out Event to mark the end of the EU-funded SWITCH Africa Green project “Sustainable Energy Consumption and Production in Agriculture and Integrated Waste Management” at the Kleinkaap Hotel in Pretoria. Working in collaboration with UNEP, UNDP and UNOPS, REEEP provided training programmes and direct capacity building activities to 150 MSMEs in the South African agricultural sector, to support them in introducing clean energy solutions into their daily operations. The trainings helped participants calculate their energy needs, identify the most beneficial renewable energy solutions for their situation and plan for the purchasing, operation and management of those solutions. Participants of the REEEP SWITCH Africa Green Training Programme Close Out event. Almost fifty stakeholders from various sectors, including academia, business, government, the UN and NGOs heard from the donors and programme coordinators about the activities of the larger SWITCH programme in Africa. Nicole Algio presented the REEEP project in more detail and discussed the outcomes of an evaluation study, highlighting a number of successes achieved and lessons learned during the implementation of the project. It has become very clear that the demand for and potential impact of continued training activities is enormous, as is the demand for continuing the platform meetings that formed an important part of the overall project. The standout stars of the day were the five beneficiary farmers who participated in the SWITCH training activities and who implemented some of the suggested interventions and activities. Champion beneficiaries of the REEEP SWITCH Africa Green Training Programme (left to right): Abraham Metsing, Nomasonto Mosia, Patrick Sekwatlakwatla, Lengau Mothiana and Deidré Egelaar. At the event, Patrick Sekwatlakwatla gave a very lively account of the changes he made to his farm after attending a training. Patrick owns two plots that are the home to 40 chickens and 85 cattle, and where he grows various vegetables. Most significantly, he invested in a solar PV system that helps him save money and ensures energy access during the regular grid black outs. Patrick introduced Abraham Metsing, who was so inspired by the REEEP trainings that he founded his own company and is now selling clean cook stoves and LED lamps to his community. His new business provides him with a source of income and supports his neighbours with cleaner and heathier solutions for cooking. Nomasonto Mosia is a small-scale farmer who after attending the REEEP trainings installed a solar powered water pump to irrigate her farm and provide energy for her home. Lengau Mothiane is a young vegetable and livestock farmer who lives in a remote off-grid area of the Free State. He had already installed a solar PV installation, but as a result of the training he implemented a number of measures to increase the efficiency of his energy use, such as installing better insulation for his home and reducing water leaks in his irrigation system. Deidré Eigelaar is a farmer at Achtervlei Farms in the Western Cape, whose business is much larger than those of the other champion beneficiaries. Deidré benefitted from meeting other stakeholders at the training. These new contacts helped her carry out energy audits, negotiate her energy prize with Eskom and effectively use and install solar PV at her farm. She appreciated the REEEP knowledge sharing approach: after learning about clean energy solutions, she was able to share her own challenges and expertise with the other participants during peer-to-pear learning sessions known as knowledge sharing clinics. 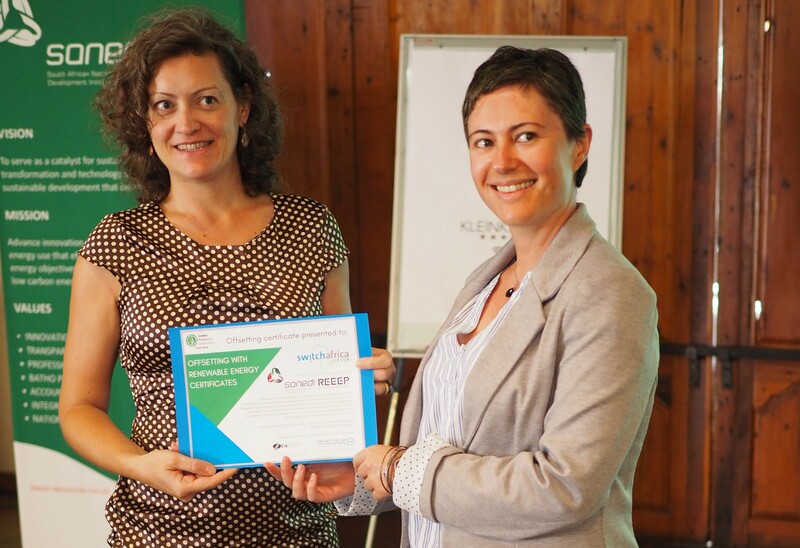 Ms Lidia Afonso Gallegos from the EU representation in South Africa receiving the Renewable Energy Certificate from Olivia Tuchten, Climate Change Advisor at Promethium Carbon. The calculated carbon emissions of the overall SWITCH project implementation were offset with the help of Promethium Carbon, through the purchase of renewable energy certificates on behalf of REEEP. This energy was purchased from the Komati Sugar Mill, which is registered on the zaRECs platform and which generates renewable energy from biowaste generated by sugarcane processing. Click the trust seal button below for more details. Find out more about the SWITCH Africa Green Project here.